It's 1982 in Worcestershire, England, and 13-year-old Jason Taylor is having a rough time of it. Balancing between the popular kids and the losers, he anxiously navigates his school days, sometimes swaying into coolness, other times a social outcast. At home, his sister has labeled him "the thing" and his parents are constantly bickering. Although he loves poetry and writes (under a pseudonym) in a local publication, he fears being found out and viewed as a sissy. He's in love with the gorgeous bully Dawn Madden, but she only teases him. Because of his stammer, he dreads being called upon in school. And to top it all off, he's broken a precious family token (his late grandfather's watch) that his father gave him. 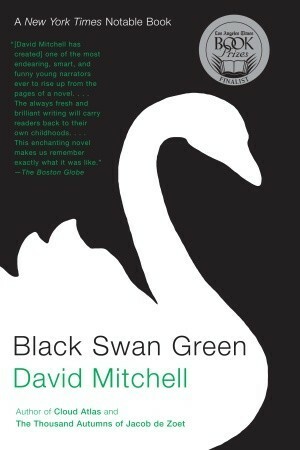 Black Swan Green is a semi-autobiographical look at the life of a teenage British boy over the course of a year. Like Jason, author David Mitchell grew up in rural England during the Cold War, wrote poetry, and has a stammer. Each chapter focuses on an event in Jason's life and (if not for some links in between) could stand on its own. At first this was a little jarring and I wasn't sure I liked it. When you reach the end of a chapter (and not all of them end neatly), that's it. That part of the story is over. The next chapter will start in on something completely new. Of course characters, themes, and small events trickle through multiple chapters, but for the most part, each chapter is its own little short story. The first chapter (or maybe the second?—I can't remember) is a bit strange too, bizarre and fantastical, and so when it ended and the next was more down-to-earth, I wasn't even sure if the events had happened at all. However, once I got into the stride of it (and that bizarre section at the beginning is explained later), I really came to love it. It's a pretty simple coming-of-age story, but it's one I hadn't heard before. Partially because it was about a boy (am I wrong to think this genre is dominated by female narrators?) and partially because of the setting and Jason himself. He's very easy to love and relate to, and after finishing the book, I felt glad to have met him (or should I say David Mitchell?). VERDICT: 4/5 stars. I'm now truly a fan of David Mitchell.